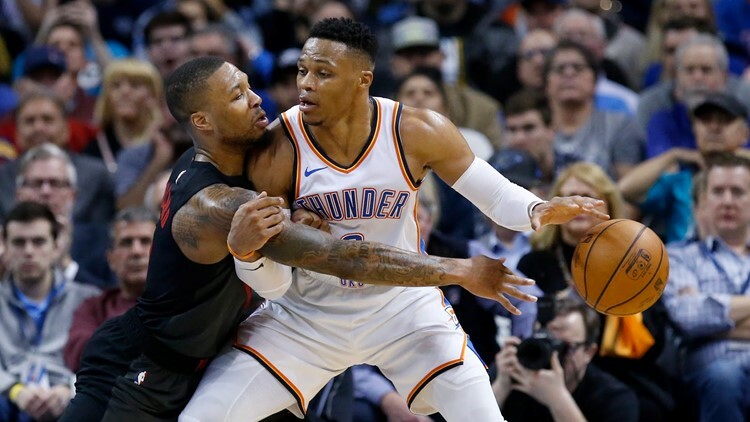 Portland Trail Blazers guard Damian Lillard, left, knocks the ball away from Oklahoma City Thunder guard Russell Westbrook. What must happen for the Blazers to win their first-round series against the Thunder? Who is the key player for Portland in this series? And how will the series ultimately play out? PORTLAND, Ore. — For the second season in a row, the Trail Blazers are the 3 seed in the ultra-competitive Western Conference. Before we dive into a playoff preview of Portland's first-round series against the Oklahoma City Thunder, let's take a moment to appreciate the undeniable success of the Blazers' regular season. Portland faced a lot of adversity this season, with the death of team owner Paul Allen at the start and a gruesome season-ending injury for beloved starting center Jusuf Nurkic near the end. Through it all, Portland never wavered. It didn't matter that preseason prognosticators didn't believe in the Blazers. Las Vegas said the Blazers would win 41 games and miss the playoffs. ESPN predicted 42 wins and the 8 seed in the West. Defying the critics, Portland raced out to a 10-3 start, persevered through a 5-10 stretch from mid-November to mid-December, caught fire after that and never looked back. Even after the Blazers lost Nurkic, Portland finished strong, winning seven of their final nine games of the season. Portland finished with 53 wins, its highest win total since the 2013-14 season. Only seven Blazers teams in franchise history have won more games than this season's team. If Trail Blazers fans are looking for optimism going into the playoffs, the fact that this team continues to excel when nobody believes in them is a good reason for Blazers fans to have faith. In this week's podcast, KGW's Orlando Sanchez, Nate Hanson and Jared Cowley look at what must happen for the Blazers to win their first-round series against the Thunder, who is the key player for Portland in this series, and make their predictions for how it will all play out. 1. It’s time to talk playoffs! If the Blazers are going to win their first-round playoff series this season, what needs to happen? Jared: If the Blazers are going to win, the Thunder need to continue to play as poorly as they have since January. Many have pegged Oklahoma City's regression in the second half of their season to their schedule becoming more difficult, but the more logical reason has been their health. The Thunder haven't been at full strength since late January, thanks to nagging injuries to Paul George and Steven Adams. George injured his shoulder in late February. The Thunder haven't released details about the injury, but one report indicated that George's injury was a minor tear in his rotator cuff. George missed three games and has played through the pain since, but he re-aggravated the injury in the second-to-last game of the season. George hasn't been the same since he got hurt. Before the injury, George averaged 28.6 points and shot 45% from the field and 40% from the 3-point line. Since the injury, his scoring is down by nearly three points and his shooting percentages have slipped to 40% from the field and 35% from the 3-point line. Adams hurt his ankle in January, and in the regular-season finale, he left the game with a shoulder injury. He returned for about 4 minutes in the second half but was ineffective. Adams started the season strong, averaging 15.4 points and 10.0 rebounds, while shooting 61% from the field and 56% from the free-throw line, with a plus-minus of +6.7. But since Adams was first hurt in late January, he's averaging 11.6 points and 8.8 rebounds, while his percentages have fallen to 56% from the field and 37% from the free-throw line. His plus-minus has fallen to +2.2. The Thunder's performance since Adams and George were injured shows how much those injuries have impacted the team. In November and December, before the injuries, the Thunder ranked 15th in offensive rating (109.2 points per 100 possessions) and first in defensive rating (101.0 points per 100). But since January, when the injuries started, though the Thunder have maintained about the same production on offense (110.6 points per 100) their defense has regressed considerably, ranking 15th (110.1 points per 100). Nate: The Blazers have to get consistent outside shooting contributions from Al-Farouq Aminu, Maurice Harkless, Seth Curry and Rodney Hood. Last year, the Pelicans exposed the Blazers' role players. They forced the ball out of Damian Lillard and CJ McCollum’s hands, and as we know, no one else for Portland was able to step up. Harkless, Aminu and Curry have all struggled to convert 3-point attempts against OKC this season, with 25% being the best individual shooting percentage. If that continues into the postseason it will be another abrupt exit for Portland. On the defensive side, Portland has to figure out how to guard the paint without Nurkic. After Nurkic got ejected in the final regular season matchup, Oklahoma City attacked Enes Kanter, knowing the flaws of the former Thunder center. Kanter was unable to limit the Thunder in the pick and roll as Oklahoma City cruised to the win in overtime. Orlando: We’ve said it over and over, someone has to take the pressure off of Damian Lillard on offense. The recipe against them has been simple, blitz him and pressure him enough to get the ball out of his hands and make someone else beat you. Harkless, Aminu, Layman, etc., have to knock down shots on a consistent basis or this series is going to be over quick. Without Jusuf Nurkic anchoring the defense, Portland may have to win a shootout. They’ll have to limit turnovers and empty possessions even more than before. CJ McCollum has to be at full strength for them to have a chance. Paul George and Russell Westbrook are a problem for the Blazers. George is averaging 38 points per game against the Blazers while Westbrook had a couple of triple-doubles. Portland needs Westbrook to turn into a volume shooter and make someone else beat you besides George. Enes Kanter has to channel his inner Nurk, protect the rim and make things difficult in pick-and-roll situations. 2. Which player is most important to a potential playoff series victory for the Blazers? Orlando: The pressure is on for a few guys to step up. Damian Lillard can’t do it on his own. He dropped 51 on OKC in their last meeting and it still wasn’t enough. Maurice Harkless will always be the X-factor, Al-Farouq Aminu has to knock down shots and the same goes for Seth Curry who was brought here for that reason alone and Enes Kanter has to be a threat on both sides of the floor. We can do an entire roll call, but if CJ McCollum isn’t 100 percent, it’s going to be another first-round exit. With the amount of focus put on Lillard, CJ is going to get a healthy dose of shots and may end up being the leading scorer in most games, just like last year, but he’s got to punish the Thunder and take over on offense. On the flip side, McCollum can’t fall asleep on defense. Dennis Schroder is coming off a 32-point night and that type of performance would be devastating for Portland. If McCollum wants to take the next step in becoming a star in this league, it’s moments like this that can do it. Jared: The most important player for the Blazers in this series is Damian Lillard. If you look at Lillard's career playoff averages, they're not that different from his career stats. He's shot slightly worse from the field and the 3-point line, but for the most part its about the same. But when you look at his playoff performances by series, you see a trend. In the series the Blazers have won, Lillard has played like a superstar. In all of the other series, he hasn't. In the Blazers' two playoff series wins, Lillard has averaged 23.8 points, 6.0 assists, 5.3 rebounds, 2.7 turnovers and shot 42% from the field and 40% from the 3-point line. In Portland's five series losses, Lillard has averaged 23.9 points, 5.3 assists, 4.3 rebounds, 3.2 turnovers and shot 39% from the field and 26% from the 3-point line. Lillard draws extra attention during the playoffs, and when he sets up his teammates, they need to make defenses pay. But Lillard also needs to perform better. He needs to play like the superstar he is, no matter what kind of defensive wrinkles the Thunder throw at him. Nate: When I first thought about this question, my instinct was to go with Enes Kanter because of how important it is he plays the best defense of his career to fill the void of Nurkic. But as I looked at the stats, I’m going to say the most important player for the Blazers is Maurice Harkless. Rip City is aware of Harkless’ ups and downs once again this season. Against Oklahoma City, it’s been all down. Harkless has averaged just 2.5 points and 4.3 rebounds per game this year against the Thunder. He’s shot a dismal 16 percent from the field and 25 percent from beyond the arc. His season net rating is +7.9. Against OKC, it’s -2.7. Not only do the Blazers need Harkless to be a threat offensively, they need his best defensive effort to slow down Paul George, who has averaged 38 points per game against Portland this season. Harkless has to be better for the Blazers to have a chance to advance to the second round. 3. Prediction time: Postseason edition! We all know the matchup. Who wins and in how many games? Nate: The Thunder win in five games. I would be shocked if the Trail Blazers find a way to win this series. Even at full strength, Portland couldn’t beat Oklahoma City. Without Jusuf Nurkic, the task to beat the Thunder not only once, but four times, is a longshot. Too much has to go right for the Blazers in a matchup that is obviously unfavorable. Combine that with Portland’s recent lack of postseason success, and I have no confidence the Blazers advance. Although I don’t expect the series to be close, I am hyped to see these teams, who have had testy moments this season, battle. Orlando: This is not the matchup the Blazers wanted. Despite winning without Nurkic to close out the season, the Blazers will have to put together their best basketball of the season to survive. I think we’re in for an entertaining and at times, chippy series. It should be one of the most competitive first-round matchups in the league. I just can’t forget what I saw all season long against this team and now they have to do it without Nurkic? I gotta see it to believe it. Blazers snap the 10-game playoff losing streak, but drop the series. Thunder win in six games. Jared: The more I research this series, the more confident I am that it will be competitive. The Blazers have been struck by injuries to key players. So have the Thunder. Portland is a top offensive team and a mediocre defensive team, not usually a predictor of playoff success (defense matters), but at least the Blazers have a good offense. Since Paul George and Steven Adams were hurt, the Thunder have been mediocre on both offense and defense. Traditionally, teams that excel in the playoffs are those that can slow it down and score in the halfcourt. The Blazers can do that. The Thunder are a transition-heavy teams that struggles in the halfcourt. Portland excels in the pick and roll, either with the ballhandler (second in the NBA in points per possession) or the rollman (seventh). The Thunder are one of the worst pick-and-roll teams in the NBA, ranking 20th in ballhandler and 29th in rollman. That's good news for the Blazers, whose biggest liability is pick-and-roll defense. Portland is also good in isolation (10th) and post-ups (11th). Oklahoma City ranks 21st and 18th in those categories, respectively. The Thunder run more than just about any team in the NBA, and transition usually dries up in the playoffs. If Oklahoma City is mediocre on offense and can't defend effectively — and since George and Adams were hurt, they haven't been a good defensive team — it's going to be hard for them to succeed in the playoffs. I'm not that confident in the Blazers, especially without Jusuf Nurkic, but I think I'm even less confident in the Thunder. I think this will be a competitive series, and I believe that home court matters. Blazers in 7. Congratulations to Jared, who finished with the win in season 2 of the podcast. Nate and Orlando finished tied for first in Season 1. Jared Cowley is a digital media producer who writes about the Blazers and other topics for KGW.com. Jared has written about the Jazz and Warriors as a sports editor at two daily newspapers. Nate Hanson is a digital producer who contributes to KGW.com’s coverage of the Blazers, Ducks, Beavers and high school sports. Orlando Sanchez is the sports anchor and reporter for KGW News, Sports Sunday and Friday Night Flights. Orlando has covered multiple NBA Finals, NCAA Basketball Tournaments and World Series.